In the first of what I hope will be a regular monthly feature, let me bring some summertime into your life. 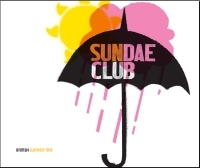 British Summer Time is the new album from Sundae Club, and it's available for free download. I met the guys from Sundae Club at an ExileInside gig a few years back, so I was intrigued to see this album get a free release. Hamstall Ridware from the band says: "It's a timely and spacey trip through the gates of a '60s airport with a Viscount sitting ready on the runway to transport you, the lucky traveller to rural Gloucestershire (the song Pies); to the industrial Midlands of 1950s Coventry (The Doddler) and 1970s Birmingham (Honey Bee); to the Far East of India and China via Germany (The Travel Trilogy) calling in on a New York apartment with flimsy walls (New Neighbours) and back home to Blighty. It's not so much Downtempo Lounge as all-tempo Departure Lounge." Regarding the strategy of releasing the album for free, he adds: "The production costs of our first album 'Technostalgia' were high because we decided to use expensive packaging, so it took a fair few sales before we broke even. We decided to release this as a free download but invite donations in a Radiohead format. In fairness, about 60% of the people who have downloaded it have donated (donations range between £1 and 12) so we're already in profit... Except that even MP3 production costs aren't free really are they? You have to factor in the cost of the studio, equipment, time, music lessons etc etc! The idea is to assess demand for a 'hard' version of it and press-up another nice CD or even vinyl if we think we can sell enough." For other acts looking to promote themselves, Ridware has some tips on what works. "Passing the word around on our mailing lists and blagging slots on radio shows [work well]," he says. "MySpace and Facebook once you've sorted out all the kids who just want to collect 'friends' and crap studios offering their services etc... We're featured in the US as incidental music on a web-based American Football show and there have been a few spin-offs from a track we wrote for a French singer who sold 450,000 copies of an album with one of our compositions on it." The album's fabulous and I recommend you whizz over to the Sundae Club website to download your copy today! If you've got any tip-offs for future free albums for this blog series (only legal stuff, please), why not drop me a line? 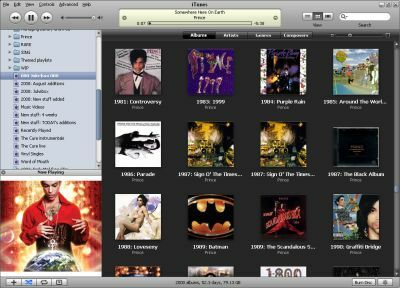 However, there's a big drawback with iTunes 8. It turns all your music into an advert for the iTunes store. When you are viewing track listings, it adds an arrow next to each artist, album and track name which searches the iTunes store when clicked. In the typical 'list view' screen, you could have about 100 tiny advert arrows. These have always been "a feature" in iTunes, but now they've removed the tickbox that lets you switch them off. Okay, so the software upgrade was free. But I've bought two new iPods over the years and the software is required to make them work. I've paid enough money to Apple to expect that the software would come 'free' and not become 'ad supported' in future. From a usability point of view, it's terrible. With 100+ adverts on screen, it's easy to click one by mistake, which results in iTunes connecting (slowly) to the iTunes store and taking you away from whatever you're doing. Interesting to note that there's no mention of this forced advertising on Apple's What's new page, and that it isn't even shown in the screenshot they have there. Blog The Glitch has a technical hack for this problem. For some reason, there were two versions of the preference file on my machine, but it worked okay when I edited them both. It did leave the arrows on the current track playing, but you can get rid of those (and indeed all the arrows) by disabling the iTunes store as a whole in the parental options. So that's what I've done, too. The end result? I'll probably buy a lot less music from Apple. There might be times when I enable the store again to shop there, but most of the music I've bought there has been from browsing through the store and coming across something unexpected. That'll stop. I'll also be much more suspicious of Apple software in general. I've just finished reading 'University of Death'. After it was published, I left it alone for a while. To be honest, I'd spent so long editing and writing it, that there were bits I could virtually recite by heart. I didn't want to read it. But over the last couple of weeks I re-read it, from the start to the end. The point of reading it again was to pick up any errors that need fixing, and I found a few including one obvious counting error. While I will be fixing those errors for subsequent copies, I won't be tampering with editing any copy now, however tempting it is to refine the odd sentence. Given that so much time has passed since I wrote it, the experience was as close as I can get to that of a real reader. It was always going to be a bit weird, though, because as I read the book, part of me knew that I'd written it. From my limited experience, reading my own novel felt like watching myself on TV - I came up to a bit that made me feel uncomfortable, and I would sort of squint through my fingers at it, even though I knew loads of other people had already seen it. I was surprised at how much I'd forgotten. Some of my favourite bits this time around were the passages I couldn't remember writing, perhaps because they were the bits that I had read less during development and so had less chance to grow tired of. Maybe also because they were the bits that had been polished less, and so were a bit more energetic. Having some distance from the book changed my perception on it. The bits I was worried might be weak stood up surprisingly well. The bits that were my favourite at the time of writing were fine, but not consistently among the strongest sections. I think there are some Easter eggs in there for people who re-read it. Some of the central relationships seem different second time around when you know how the story ends. There are a few continuity gags (Marian misinterpreting band names, how Silent But Violent is described) and there are some jokes that people have told me they missed first time around (why the woman working in Starbucks was so grumpy, who Marian sent to chase Simon and Fred out of the building). They're not always set up as proper jokes, but I'm pleased that I didn't draw too much attention to them and just left them as amusing discoveries. As a whole, I was pleased with how the story was structured and how it all came together at the end. I enjoyed the journey that the characters took me on. It was like visiting old friends. Farewell then to Richard Wright, keyboard player and co-composer with Pink Floyd. He was instrumental in the creation of Wish You Were Here, probably my favourite album ever, and one I've always found myself drawn back to since I first heard it in 1989. Last year on David Gilmour's tour, it was a real thrill to hear him perform Floyd's debut single 'Arnold Layne' with fellow Floydies Gilmour on guitar and Mason on drums. The politics of the band probably stopped him contributing as much as he was able, but his tracks 'See Saw' and 'Remember a Day' are as fine as anything Waters and Barrett wrote in the psychedelic era. He's best known for contributing 'Us and them' and instrumental 'The great gig in the sky' to 'Dark Side of the Moon' as a songwriter, but he had a big influence on all the truly great Floyd albums from 'Piper' through 'Meddle' and 'Dark Side', through to 'The Division Bell'. There's no folklore surrounding Rick as there was with Floyd's first front man Syd, but Richard Wright leaves behind a rich body of music that will inspire many of us for decades to come. Anyone else get Paul Young's 1983 album No Parlez with the Mail this week, and think that track 8 sounds like the music from Animal Crossing on the DS? Oh, right. Just me, then. Gosh! It's a good week for book PR. Writers' Forum has published a great story about the tool I've created to enable books to be signed over the internet. It uses a virtually unknown feature of Internet Explorer to send a font of the author's handwriting over the web. The technique enables dedications to be customised with the recipient's name (and potentially, other details too). You can try the tool out by getting your copy of 'University of Death' signed now. It's great story in the magazine, half a page including my photo and a cover shot. It's nice to be mentioned in the same story as Stephen King and Margaret Atwood, too. I've offered to help other authors to set up the same facility on their websites. Drop me a line, if you're interested. You'll need to have FTP access to your server, but if you're happy with that, then I can talk you through the steps to get the rest of it working. I've created a simplified widget and Facebook application based on my Writing Wisdom Widget. The simplified version can also be added to iGoogle, blogs and websites easily, although in all cases it lacks the advanced customisation of the version here. If you're on Facebook, please consider adding the application and feel free to use the new or old version of the quotes widget on your website or blog.